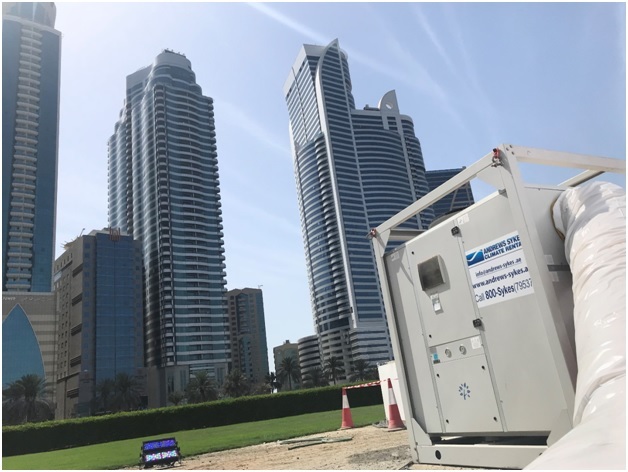 Under very high temperature and harsh dusty climatic conditions, Andrews Sykes provides high performance & lesser maintenance air conditioners, which is optimal for the cooling solutions in the Middle East. Andrews Sykes have wide range of packaged climate control products for the hot summer in the Middle East. During temperature of 43oC and at an average humidity of 78% Andrews Sykes high performance package units meet the client specifications and requirements. All credit goes to the technical team who always give above par dedication towards Andrews Sykes Climate Rental. This article was posted in AC Package Unit Rental, AC Rental, Air Conditioner Rental, Air conditioning rental and tagged High Performance Air Conditioner, HPAC90, temporary cooling package. Both comments and trackbacks are closed.